The vessel is in good condition and has been well taken care of. The engine room is very clean and painted. Hull and exterior paint are in great shape. The hull was completely stripped and re-gel coated in 2011. The forward AC unit is not working and needs to be replaced. Windows are in good shape and are not leaking. The vessel has been in fresh water for the last 15 years. Stock #170590 Great Condition!! 3208 CATS!! Naturally Aspirated!! Raytheon Electronics!! 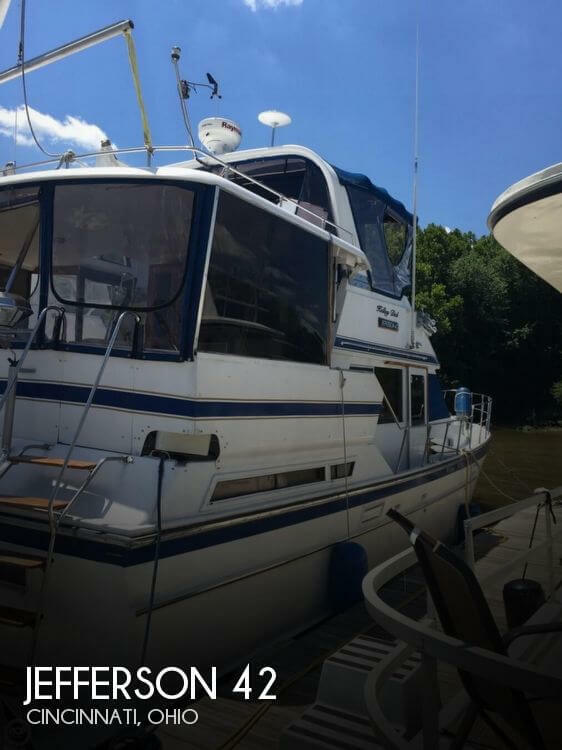 If you are in the market for a motoryacht, look no further than this 1986 Jefferson 42 Sundeck, just reduced to $69,900 (offers encouraged). This vessel is located in Cincinnati, Ohio and is in good condition. She is also equipped with twin Caterpillar engines that have 3,585 hours. Reason for selling is not using. 1987 Jefferson 42 SE Sundeck Motor Yacht This Jefferson 42 Motor Yacht has been well maintained by her knowledgable owner. With her Caterpillar 3208 motors she is a perfect boat for cruising the coast. She would also make a great live-aboard! Included is a 10' West Marine HBI with 8 hp Yamaha. Owner looking to move down in size. 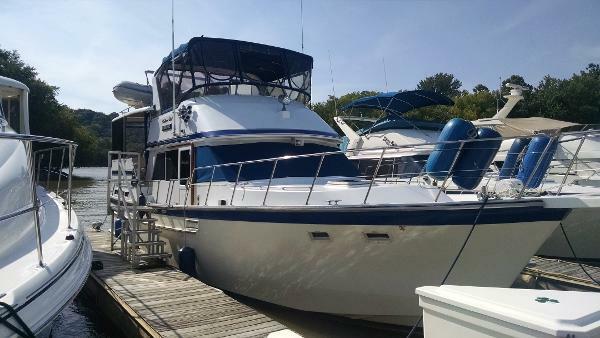 1988 Jefferson 42 SE Sundeck Motor Yacht Fresh water only two owner boat! Powered with in-line 6 cylinder Cummin diesels with 1,112 hours. Stored inside heated since new winters. The Jefferson 42 Sundeck is fairly straight forward double-cabin design with attractive lines. The layout features a large master stateroom aft with a walk-around queen berth and an offset bunk beds in the forward stateroom. A tub/shower is included in the head adjoining the owners aft stateroom, while a separate stall shower is found in the forward head. Large wraparound windows add plenty of natural lighting, and good quality teak joinerwork is used throughout the interior. Outside, the 42 Sundeck has wide sidedecks, and the full-width aft deck is great for dockside entertaining. 1987 Jefferson 42 Sundeck The Jefferson 42 Sundeck is an extremely popular motor yacht for a variety of reasons. 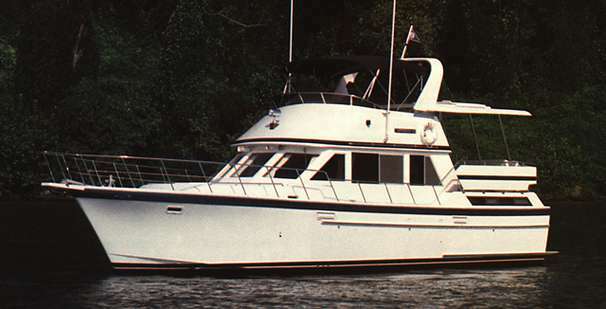 Vessel features include traditional styling, with high quality, solid teak woodwork and joinery, comfortable two stateroom, two full head layout (tub/shower in master), full galley-down with convertible dinette, expansive salon with built-in settee and full lower helm w/ side door for deck access. Outside, owners and guests will enjoy the spacious aft deck (under a hard top) with removable enclosure for year-round use. From the sundeck, solid wing doors access wide side decks, allowing safe egress to the large foredeck for line & anchor management, sunning or simply taking in the view. Up top, the bridge is large and very well laid out, with centerline helm and port & starboard side seating that will accommodate a robust crowd. 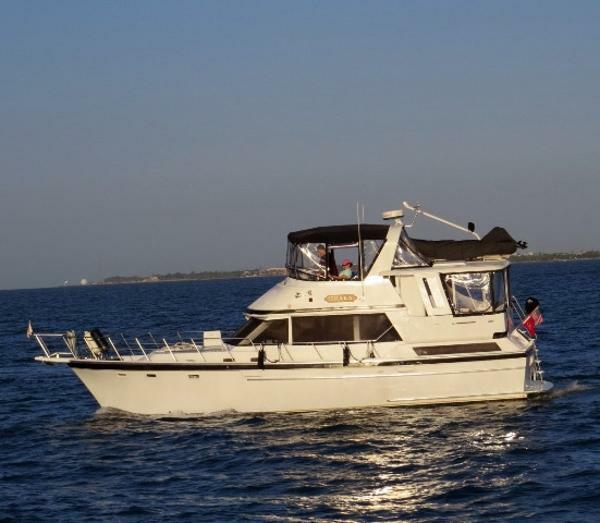 When underway, the captain will appreciate the efficient and dependable Perkins diesels, and crew & guests can enjoy the climate controlled comfort of marine ac/heat powered by a Westerbeke generator. With its 14 ft beam and wonderful use of space, the 42SD has earned acclaim from Loopers and Live-aboards, as well as those who enjoy entertaining in luxury and comfort. Don’t miss this beautiful motor yacht that’s ready & waiting to fulfill your boating adventures. NEW LISTING. ADDITIONAL INFO COMING. 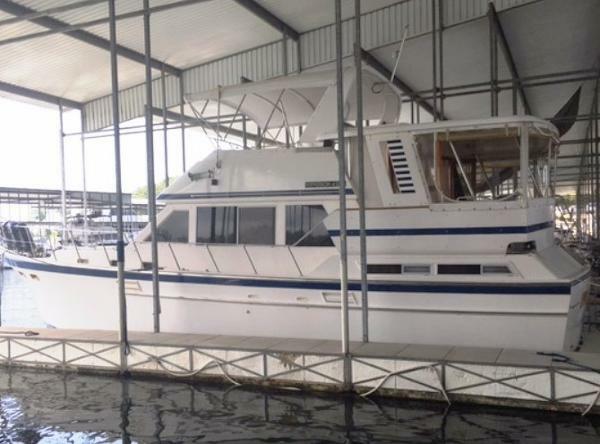 1987 Jefferson 42 Aft Cabin Motoryacht Knot Too Big is a classic 42' Jefferson aft cabin motoryacht in good condition.. She offers the usual double cabin layout and her guest stateroom includes an enclosed shower in the ensuite head. She also offers a 2500 watt inverter, fuel efficient Perkins Range 4 240 hp main engines, Garmin HD Radar and 7212 multi-function display, new flybridge and sundeck Eisenglass enclosures with No-Seeum screens and a new anchor windlass. Knot Too Big is cruising The Great Loop, but she can be inspected anytime. 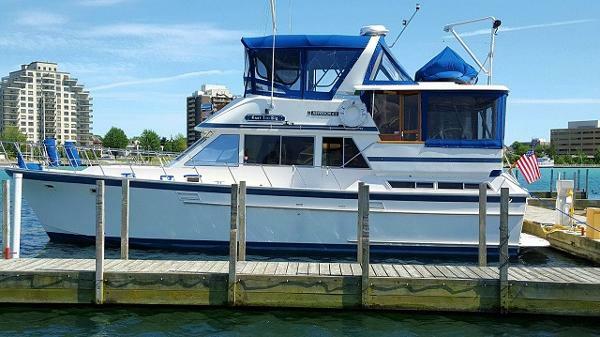 1988 Jefferson 42 Aft Cabin Motoryacht Nauti Nell is a classic 42' Jefferson aft cabin motoryacht in good condition.. She offers the usual double cabin layout, but her guest stateroom includes an enclosed shower in the ensuite head. There are numerous updates, like the 5,000 watt inverter, and she offers fuel efficient Caterpillar 3208 260 hp main engines. Nauti Nell is cruising the East Coast, but she is available for inspection anytime. 1986 Jefferson 42 Aft Cabin Motor Yacht Ithaka is a very well-maintained 42' Jefferson offering a full beam master stateroom aft, guest stateroom forward with ensuite head, updated electronics, new bottom paint and zincs in 2015, newer Caterpillar main engines, new aluminum fuel tanks in 2008 and exterior Awlgrip paint. Ithaka is a two-time Great Loop veteran. She is by far the nicest 42' Jefferson available. Price reduced! 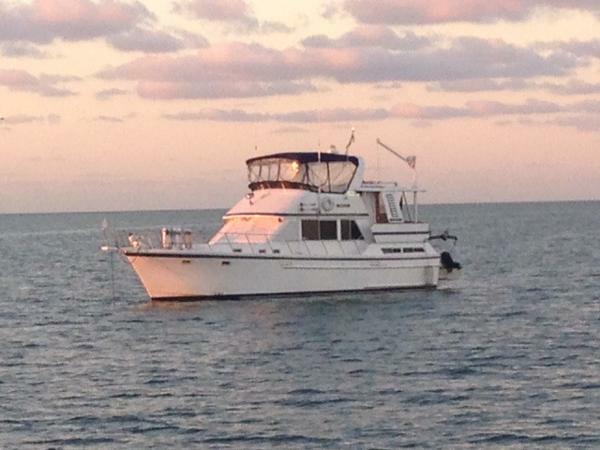 1986 Jefferson Sundeck 42 Motoryacht Load for cruising or live-aboard.. This vessel runs very well and so does the gen set. It comes complete with a Caribe dingy with 25 hp Nissan mounted to the upper deck. 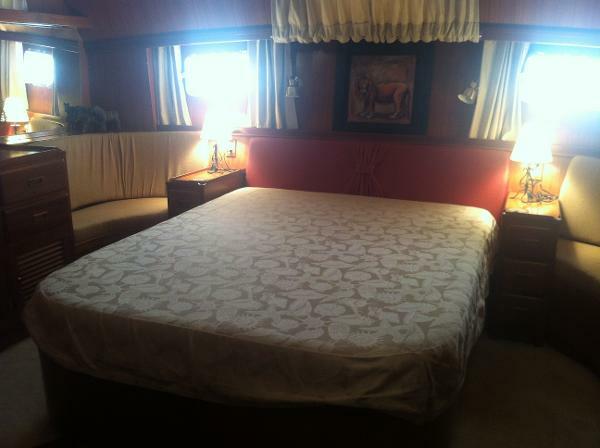 There are many nautical decorations aboard and most of the stay. The master suite in the aft stateroom is massive, plenty of storage and the natural wood finish is just gorgeous with the adjoining master head complete with shower and bath tub. In order to appreciate this vessel, one must personally view all the features and comforts this boat has to offer. It could be a man cave as well as an entertainment center for family, friends or clients. 1987 Jefferson 42 Sundeck Motor Yacht Major Price Reduction...R Gang should have been named Meticulous! This is the cleanest, most pristine most pristine of the 42 Jeffersons I have ever seen. 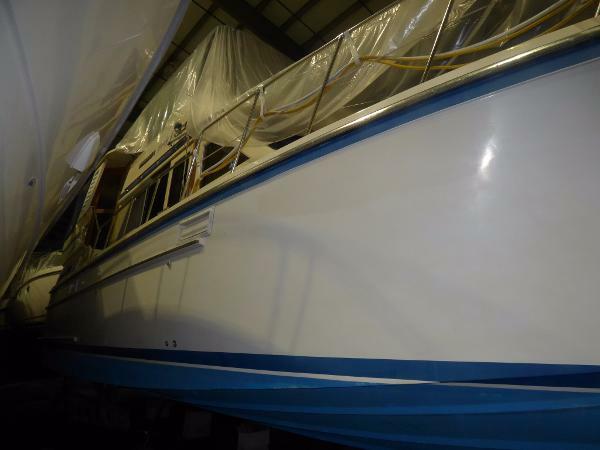 The teak has been well maintained, the gelcoat is shiny, nearly every system has been updated. The best news is its all Fresh Water History. The boat came from Michigan a few years ago and came back to the Louisville area, just a few miles from the home of Jefferson Yachts. Located on the Ohio River, Navigable waterway to anywhere.